NEW FINDINGS FROM HUFFINGTON POST VR STUDY COMING SOON!!! What is the general audience response to a VR journalism experience? After Solitary’s key success was using the virtual space to connect participants’ perspectives with Kenny’s physical state and emotional journey. After Solitary inspired interest in VR journalism. Room-scale VR was the most effective platform for creating a sense of spatial presence. It is not clear if attitude and behavior changes differ by platform; participants’ self reports all indicated more knowledge, interest, and intent to take actions. 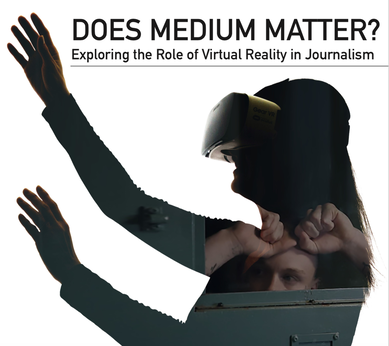 Medium matters: Participants using Room-scale VR focused on their own perspective and experiences, but participants who used 360 video took the perspective of outsiders looking in, and commented on details of Kenny’s story. Greenland Melting’s key success was using the virtual space to demonstrate specific concepts by using time lapse, or placing users in physically impossible perspectives to make comparisons. Participants liked the Room-scale VR experience more, and felt more spatial presence using it, even though the video was easier to use. VR-first participants were more likely to report an emotional response to the material, including feeling “unsettled,” “concerned,” and “frightened.” However, other changes in attitudes or behavior did not follow a clear pattern. VR participants did not do as well on the knowledge questions. Because VR participants were more absorbed in exploring the virtual space, they had fewer resources available for processing facts. More research is needed to align the affordances of virtual reality platforms with the needs of users, and the goals of journalists and creators. Room-scale VR is the most effective way to create a feeling of “being there.” For environments with unique spatial characteristics, it creates that feeling to a greater degree than regular video, or even Immersive 360 video. However, the novelty of the medium creates incentives to explore the space rather than absorb information, and provides enormous potential for distraction from complex narratives or information-dense sequences. Balancing these characteristics is the key to developing journalistic content for this medium. If participants in VR can control where to look, but cannot interact with objects in the environment, they have “presence” but not total “agency” — they have a limited ability to influence the environment. Leverage their role as an active viewer to reward curiosity about the environment. Designing the freedom to explore and discover information, rather than informational goals and user agency working at cross purposes, is the challenge of the medium. Participants in immersive experiences are not familiar with the meaning of editing conventions yet, so it is still important to clarify the “rules” of the environment. Visual cues about spatial environments, like where the horizon is or where the walls of a room meet, or using controllers to represent a participant’s hands, can be used to help participants stay oriented between scenes. Spatial cues in audio input should also be consistent. Unusual spatial positioning or movement should not be deployed alongside crucial informational content in the event that the participant has an adverse physical reaction, or is too distracted by the unfamiliar experience to recognize, encode and retain information. For sequences that integrate significant movement into the experience, mechanisms to detect non-participation and prompting or alternative choices should be provided. Having a character in a virtual experience to provide guidance and context for information is extremely valuable. Although participants noticed artifacts of the photogrammetry process and wanted each figure’s appearance to be more naturalistic, the benefits outweigh the costs and provided some of the most striking moments of both After Solitary and Greenland Melting. VR experiences absorb users’ attention for short, intense periods of time. VR inspires users to seek more information afterwards, but is not the most effective medium to commit facts to memory.